The deadline for the “Selected Professions” fellowships offered by the American Association of University Women (AAUW) is Jan 10, 2013. These fellowships support women in degree programs in which women’s participation traditionally has been low. Applicants must be citizens or permanent residents of the United States. There are two types of special fellowships. Check out the others types, too. Visit the range of fellowships. I. Science & Technology Group Fellowships. II. Focus Professions Group Fellowships. These fellowships are open only to women from ethnic minority groups historically underrepresented in these fields. Eligible groups include African Americans, Mexican Americans, Puerto Ricans and other Hispanics, Native Americans/Alaska Natives, and Asian American/Pacific Islanders. • Business Administration (M.B.A.) – applicants may apply for 2nd year of study only. • Law (J.D.) – applicants may apply for 3rd year of study only. • Medicine (M.D.) – applicants may apply for 3rd or 4th year of study only. 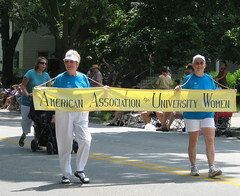 Students apply directly to AAUW, and the deadline is January 10, 2013. For application procedures and additional details, see the AAUW website. This entry was posted in Fellowships and tagged AAUW, business education, Fellow, Law education, Medical Education, STEM on December 19, 2012 by wahtera.